I recently had the chance to sit down with Rich Soares from Mile High Triathlon to discuss several key sports psychology tips for open water swimming. This was an engaging conversation based partially on my own terrifying experiences of my first open water swim at the Boulder Peak Triathlon a few years ago. 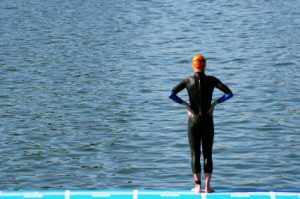 In this podcast you will learn several key sports psychology tips for mastering open water swimming in triathlon. Learn how to be calm, confident and smooth in the water without letting anxiety or fear impact your performance. I hope you enjoy the podcast. This entry was posted in Counseling, Denver, Exercise, Featured Articles, Health Psychology, Recent Articles, Sports Psychology. Bookmark the permalink.